A pioneering partnership between the UN and ProFuturo to promote quality digital education in developing countries. César Alierta will be heading up this working area, as announced at the presentation of the report “Sustainable Development Goals and the Private Sector” by the UN’s Sustainable Development Goals Fund (SDGF). The appointment was announced during the presentation of the report: “Sustainable Development Goals and the Private Sector” by the UN’s Sustainable Development Goals Fund (SDGF). The United Nations and ProFuturo are creating a partnership to promote digital education in developing countries. 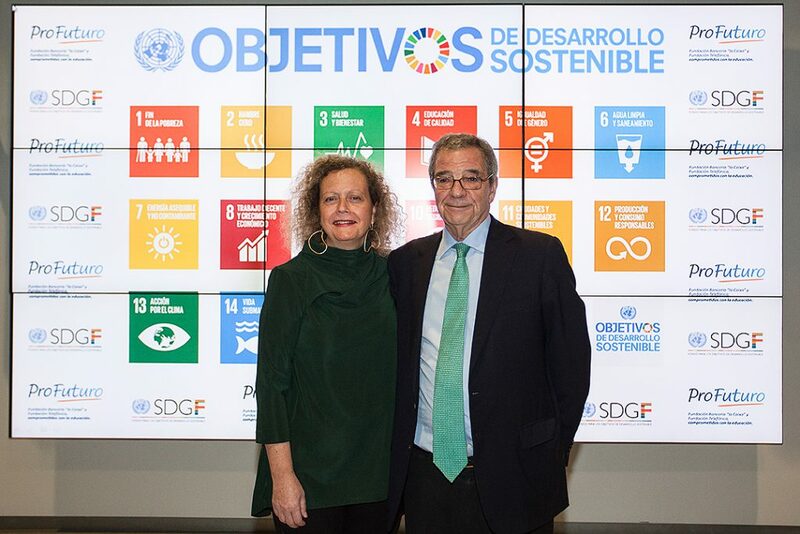 The director of the UN’s Sustainable Development Goals Fund, Paloma Durán, announced a strategic partnership with ProFuturo to promote high quality digital education in developing countries: “We’re embarking on a line of work with ProFuturo to implement an ambitious global project,” said Durán before announcing the name of the person who will be heading up the project: “and the best of all is that it will be run by César Alierta. Many thanks, César, for your generous support! Through educated societies we can improve people’s quality of life,” noted Durán at the presentation of the report on SDG and the Private Sector, which you can view on the website and the social networks using hashtags #EmpresasODS and #Profuturo. The agreement between ProFuturo, the programme supported by Fundación Telefónica and the “la Caixa” Banking Foundation, and the UN’s SDG Fund aims to provide a framework of cooperation between the two entities to promote a line of work based on digital education. “Through digital education we can provide everyone with high quality education, wherever they may be in the world,” said César Alierta, the executive president of Fundación Telefónica, patron of the “la Caixa” Banking Foundation and director of ProFuturo. Alierta will be responsible for heading up this working area as the Global Advisor of the UN’s SDG Fund for Digital Education and Sustainable Development. The aim of this collaboration is to provide a framework for cooperation between the two organisations in three areas: the search for partners and alliances, getting the private sector involved in developing education, and the implementation of a line of work on digital education. The report “Sustainable Development Goals and the Private Sector” details the experiences of companies such as Microsoft, Ernst & Young, H&M and Ferrovial, amongst others, and identifies areas of mutual interest on which to work to achieve sustainable development. The project demonstrates the interest of public and private associations in supporting developing countries and incorporating practices in their work that can help to improve their situation. Why is high quality education so important? ProFuturo is an initiative of Fundación Telefónica and the “la Caixa” Banking Foundation to improve the education of more than 10 million children over a five-year period in Africa, Latin America and Asia, with the aim of improving equal opportunities around the world. The initiative will use every measure available to it to reduce the global educational gap and promote the digital education of children in emerging countries. The project aspires to welcome and promote the participation of other companies and institutions. Projects are currently underway in Africa and Latin America and the plan is to extend the programme in Asia. The Sustainable Development Goals Fund is an international cooperation mechanism which was set up in 2014 by the United Nations thanks to an initial contribution from the Spanish Government. The Fund was the first mechanism created specifically to achieve Sustainable Development Goals and the UN Agenda 2030, and aims to promote the cooperation between UN Agencies, governments, civil society, the private sector and universities to achieve sustainable development and combat poverty. The Fund operates in 23 countries, with 14 UN Agencies, and has a direct impact on 1.4 million people.